This visit from percussionist Tatsuya Nakatani– one of our favorite anomalies- will be his third to Orlando within as many years. His anomalies are positives: he bows to folk traditions as he’s setting up to smash them down. He rarely plays on the biggest creative music festivals, yet he probably tours and performs in front of partisan and soon-to-be-partisan audiences more nights a year than almost any musician performing out of the U.S. avant-garde. Take a look at his current tour schedule and you’ll count out three solid months routing around the U.S. alone, traveling in a Dodge Sprinter van that includes a phalanx of gongs and percussion instruments, a small kitchen and a loft bed. 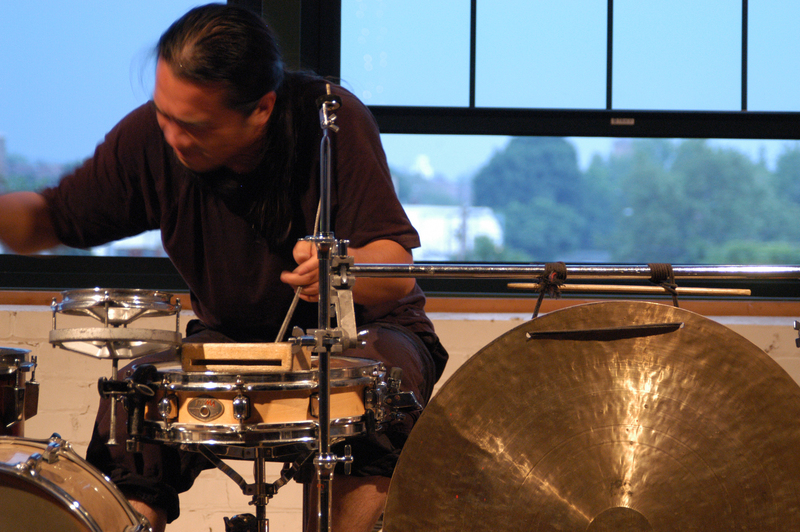 After two mesmerizing solo percussion concerts here, events that were able to be taken as storytelling and ritual to stone-silent audiences, Nakatani requested a different narrative, looking for an unscripted collaboration. With this, Tatsuya Nakatani becomes part the cm5’s One And One series, matching up solo artists on a given night and then stepping out of the curatorial way, allowing each performer make a solo statement and then collectively decide what happens next. This version of One And One includes another And One with Tampa Bay area reed player David Pate and Orlando’s multi-instrumental Kevin Stever as partners. Tatsuya Nakatani was born in Osaka, Japan, but has made Easton, Pennsylvania his home base for the last dozen or so years. He has extensively traveled the world performing on a modified drum set, gongs, cymbals, singing bowls and various metal objects. His discography boasts roughly fifty recordings. David Pate is a Florida native, born in Clearwater and is currently a Tampa Bay-area resident. During a musical emigration to Manhattan, he became a member of volcanic drummer Ronald Shannon Jackson’s ensemble. David has performed in several Civic Minded 5 concerts over the years, including Ken Field Quintet and two concerts with SHIM. He has been a long-time tenor saxophonist in Sam Rivers’ Rivbea Orchestra and reed player in the Frank Zappa repertory ensemble Bogus Pomp. Pate currently teaches at St. Petersburg College and Pinellas County Center For The Arts. Kevin Stever is also a Florida native, born in Miami, moving north to the Orlando area as a teen. Stever was a member of the ubiquitous Orlando ensemble Jazz X and the related Maitland Turntable Ensemble in the 1990s; performing on keyboards, double bass and low-budget, mecha-slave turntables. Stever became an electric and double bassist in Sam Rivers’ Trio and Rivbea Orchestra around this same period. 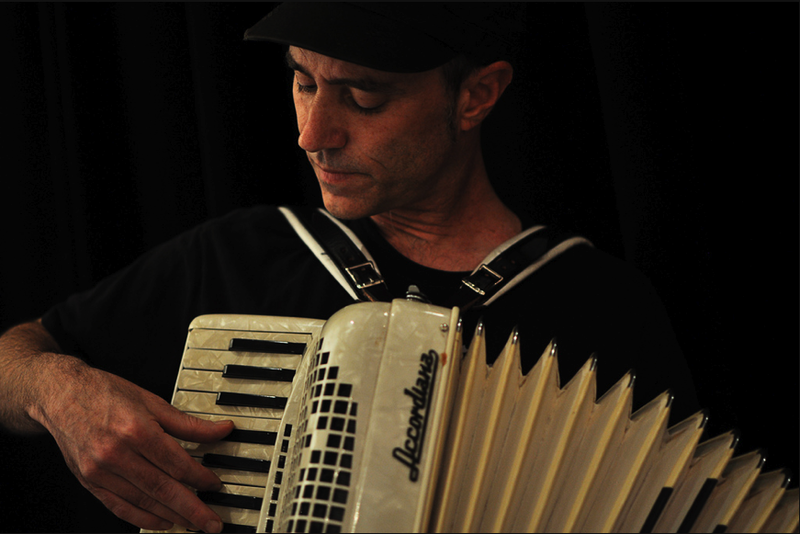 Stever’s interest in Caribbean, disco, funk, Cuban, rock, pop, jazz, classical and modern music led him to found the Kevin Stever Nonet. Stever’s Nonet echoed Miles Davis’ unorthodox 1949 nonet, by employing French horn, violins, trombone and lap top computer, resulting in an improvising, orchestral Latin-tinged dance band. Kevin Stever is currently the Course Director for Producing And Arranging at Full Sail University. Nakatani’s May 2011 visit to the Timucua white house featured two incisive performances, with the first being a lengthy audience-free “sound check” (there was no micing or sound reinforcement) consisting of careful bowing and malleting of gongs, minor physical adjustments, more gonging and visits to the corners of the performance space to take a turn as listener. The exacting detail paid off once Nakatani took the stage for his public performance at Timucua. Robust reflections and ghostly overtones presented a noticeably different event to the inhabitant of each bit of personal space at the Glazer family’s white house. On this tour through Florida, Tatsuya Nakatani will be performing his solo percussion sets in Jacksonville, Miami, St. Petersburg and Tallahassee, and his Nakatani Gong Orchestra with guest percussionists in Gainesville and Panama City. Tags: Civic Minded 5, cm5, David Pate, Kevin Stever, Sam Rivers, Tatsuya Nakatani, Timucua Arts Foundation, Timucua white house. Bookmark the permalink.